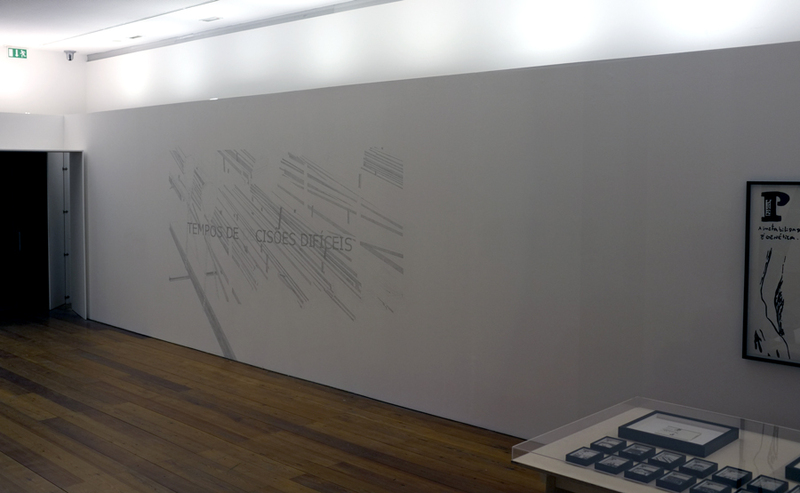 Tempos de decisões difíceis [Times of tough decisions] consists of a wall drawing made for the exhibition celebrating the 10 years of activity of the artist-run-space Laboratório das Artes. 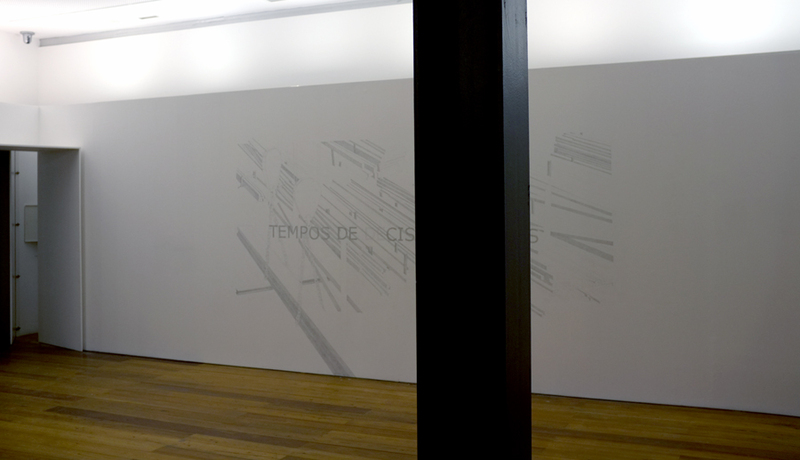 This works responds to the exhibition’s concept “Território de trabalho”in multiple ways. 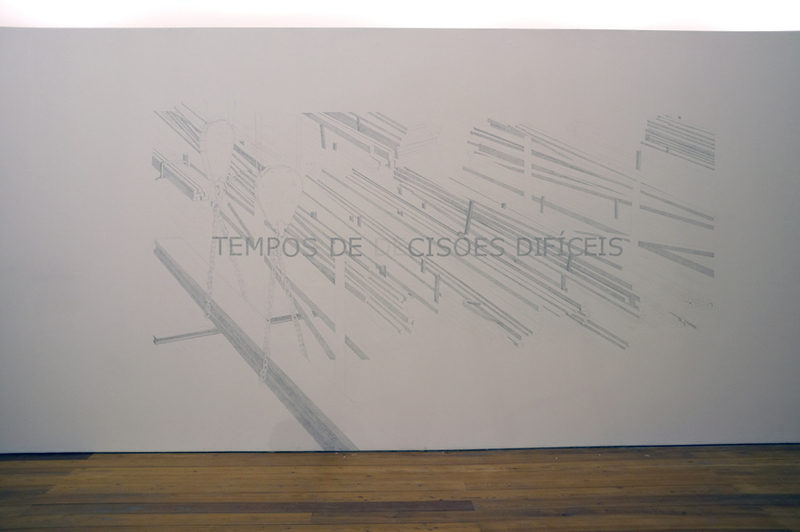 The sentence Tempos de decisões difíceis talks both to what happens in the artist studio, in the making, but also about the contemporary condition of artists and population at large in a particularly tough moment in Portugal's economic and social history. The mural was produced on site resulting from a long laborious and repetitive work. Its duration is ephemeral and plays with the contradictions inherent to a fragile monumentality, as well as resisting in becoming yet another commodified art object. 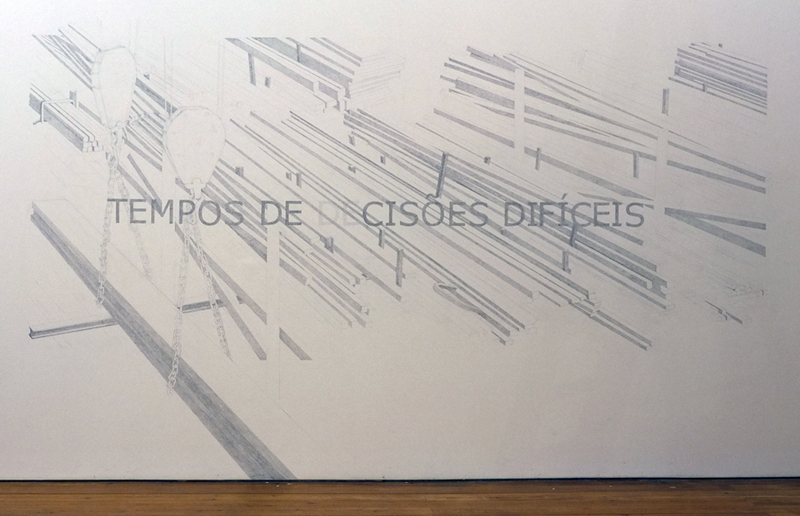 Tempos de decisões difíceis consists of mural depicting the image of a lumber deposit site - in any case, something that looks under construction. 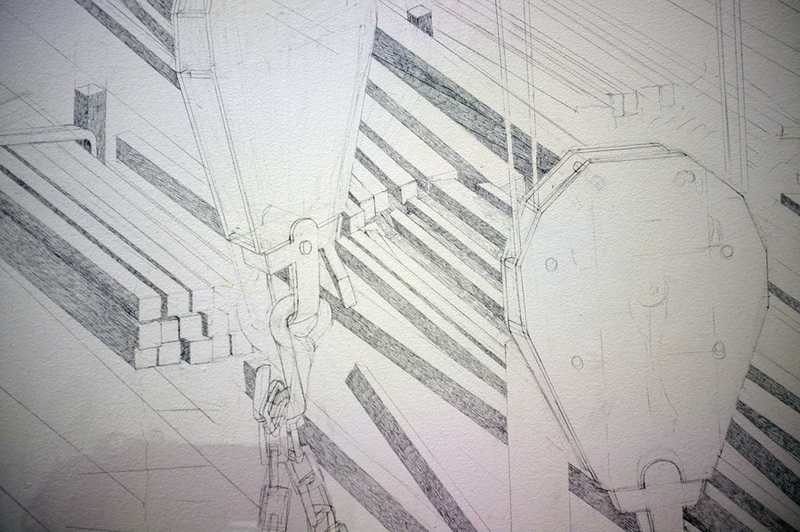 The drawing is not fully filled, giving the impression of being itself under construction. 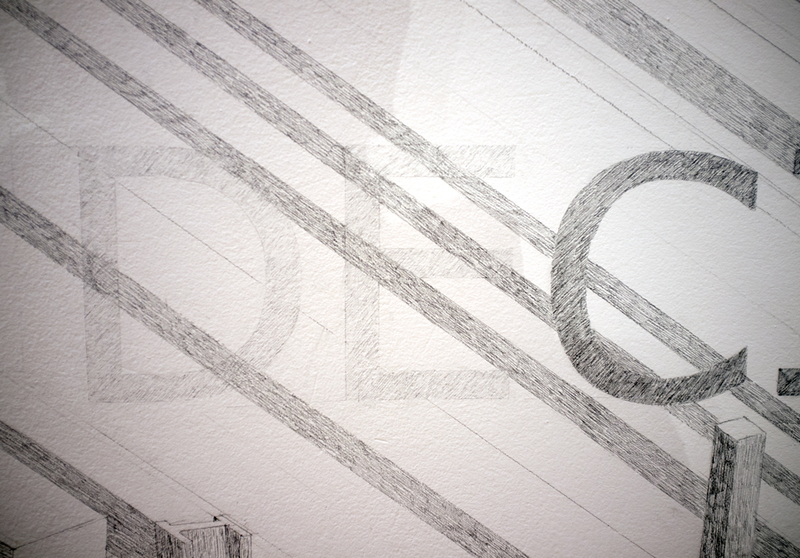 This landscape sets the background for the sentence Tempos de decisões difíceis [Times of tough decisions] that play deliberately with the meaning of the sentence by using a lighter filling in the word ‘decisões’ [decisions]. The translation of the word-game in Portuguese is impossible to translate. 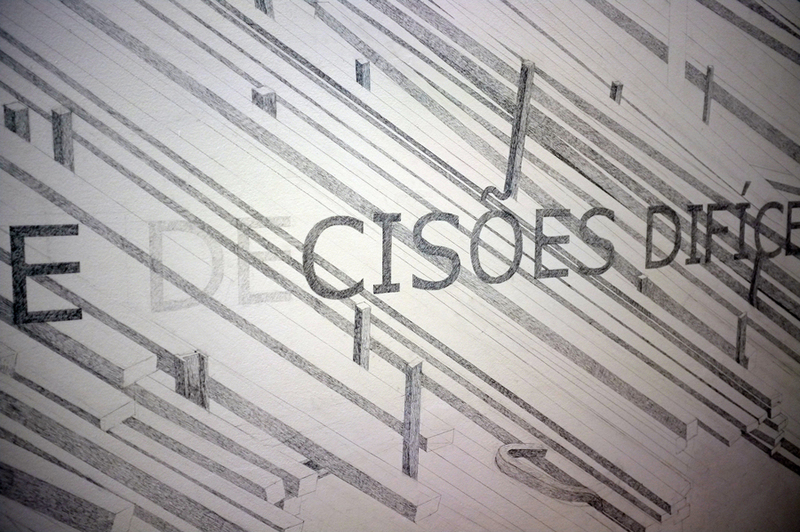 What happens is that this shift in filling of the word, also allow us from different points of the room of reading the full word ‘decisões’ [decisions], or only the darker part ‘cisões’ [splits]. 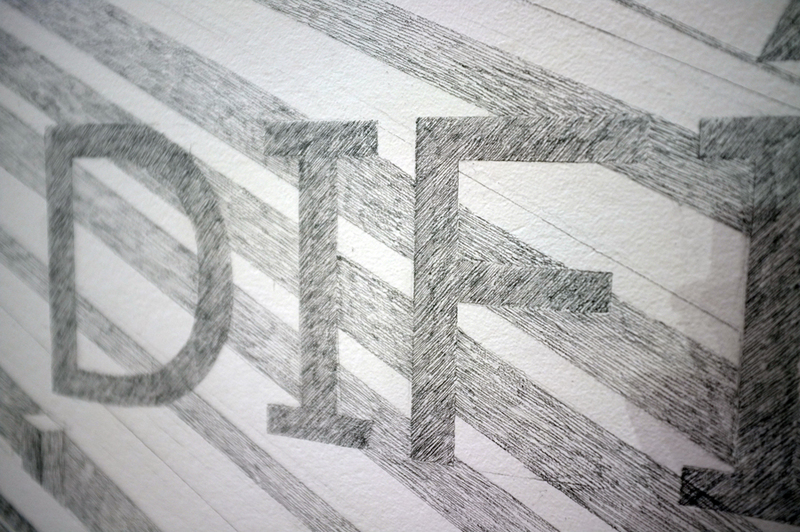 The variation of meaning of the sentence by moving in space is a fundamental aspect of the work. The intentional shift of reading heightens the slippage of the words from decision to split, a sort of bellows methodology.